UPDATE: Over the years, I've made one little addition to this recipe, that I think makes this recipe even more delicious. After the mustard seeds sputter, add 1/2 tsp cumin seeds and let it release its aroma, should take a few seconds. Then continue with the recipe. Nothing else changes. Keep a close eye on the cumin seeds and don't let it burn. Also, I have come to realise that there is a difference in the size of sour limes found in India and other countries. You need just a few drops, maybe a teaspoon of it for a mild change in flavours. I've been having such crazy days of late, I just don't know where all the 24 hours off the day go. Things such seem to be happening at such a frenzied pace, and that too for no reason in particular. I wonder what brought this on. Since I haven't been able to devote much time to this space, I decided I was going to make up for it by posting one of my all time favorites - the humble aloo bhaji (A mildly spiced potato stir fry.) I do love my fries and mashed potatoes, but sometimes I find myself longing for a portion of this stir fry. Making this stir fry can be super quick, not to mention easy, if you have a few boiled potatoes at hand. Make sure that when you're boiling potatoes for this stir fry, you don't overcook them, else they will not hold their shape and get all mushy. It'll still taste great, but just won't be as much of a visual treat. I usually wash the potatoes and pressure cook them with some water and salt for about 10 minutes after the first whistle. Remember to turn your gas to low after the whistle. If you don't want to use a pressure cooker, peel and cube the potatoes and cover them in water, add a little salt and boil them on the stovetop till tender. This stir fry is a versatile side dish. In India, every region tweaks it a little and uses it in loads of different ways. It can be served with some hot chapatis (Whole wheat flat bread), pooris (savory deep fried flat bread), used as stuffing for masala dosas (savory crispy crepes filled with this potato mix) and so on. I'm going to try to post each of these in the future. Oh! and by the way, this potato mix makes for a lovely topping on a slice of toasted bread or can also be used as a filling for a grilled sandwich. How about that! On a medium flame, add the mustard seeds and let them sputter. Add the curry leaves and the chopped chilly. Let it fry for a few seconds. Add the cumin seeds and immediately after tip in the chopped onions and saute it for a few minutes till the onions have softened and turned a light brown. Add the turmeric powder and stir well. Let it cook for about a minute. Stir to make sure it doesn't stick to the pan and burn. Tip in the potatoes and stir well till the potatoes are well coated with the spice mix. Add the lime juice and salt to taste and stir well. 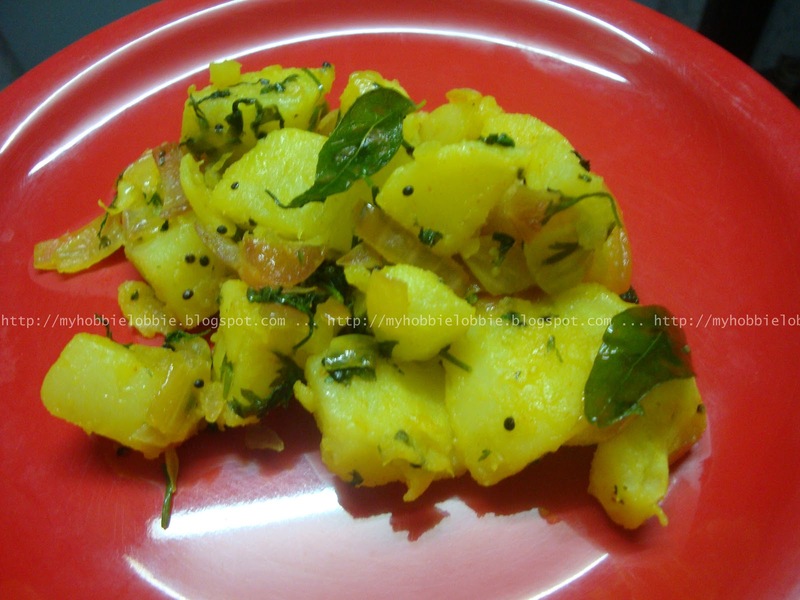 Once the potatoes have heated through, sprinkle the chopped coriander leaves and toss lightly. Take the pan off the heat. Your recipes all look delicious. I can't wait to try a few. Aloo Bhaji looks delicious thanks for sharing with Hearth and soul hop. this looks absolutely delicious! You have a great blog with a lot of amazing recipes! thanks for visiting my blog and for your sweet comments! I love making new blog friends! I am your newest follower and would love it if you would follow me too! Thanks! I had troubles yesterday when I was trying to comment. I thought this would make a delicious alternative to traditional potato salads at a picnic or potluck. Thanks for sharing this recipe with the Heath and Soul Hop. Trisha, I hope the hectic pace of life has eased up a bit. I know how head-spinning it can be when the days whiz by. Your Aloo-Bhaji sounds delicious. I love the combination of spices. I'm featuring your post on my FB page today! Thanks for stopping by and for the feature Jenn!